Jaguar is going all-in with electric cars with plans to to put electric power into all of its models by 2020. To help familiarize consumers who may have some qualms about the future of these vehicles (range angst, anyone? ), the company is staging a nationwide tour billed as “Jaguar Electrifies Experience” that showcases its products with an emphasis on its first electric-power vehicle, the I-Pace SUV. Well, it’s “nationwide” in that the debut was in San Francisco, and this weekend’s edition was in Miami. Next venues are in Los Angles in mid-December and New York early next year, which leaves a lot of the nation uncovered. But maybe some will be added later. The Jaguar Electrifies Experience gives consumers not only the time to get a close-up look at all the new vehicles without a salesperson hovering over them but also the opportunity to see how the I-Pace handles on a “SmartCone” closed course and to take it out for short spin on city streets. There’s also see an exhibit from Wired magazine to learn how an electric vehicle can fit into their future. —Thanks to the location of the 90 kWh lithium-ion battery stretching across under the front floorboards, the I-Pace handled the closed-cone course with ease. There is no vehicle sway with the sharp changes of direction. 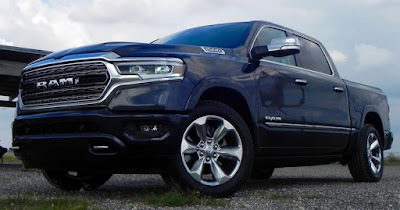 —The throttle response is amazing. I was in the back for the spin around a few blocks and when my driving partner hit the accelerator (can’t call it a “gas” pedal now, can we?) I was pushed back significantly in the seat. That’s because the I-Pace is powered by two 197-horsepower motors, one operating the front wheels, the other the rear, for a combined 394 hp and a whopping 512 lb.-ft. of torque. The zero-to-60 mph clocking is 4.5 seconds! Jaguar says the I-Pace has a range of up to 243 miles on a full charge, but the rep who rode with us said that there have been reports of a range of up to 290 miles. Heating or cooling the vehicle while it is plugged in and recharging also helps to get to maximum range by reducing the draw on the car’s battery to reach desired temperatures. Charging time, always an issue with the electric vehicles I have had the opportunity to drive, also is reduced. 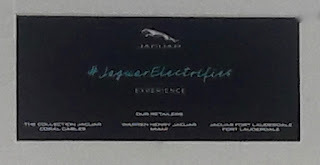 Jaguar says that owners will be able to achieve a zero-to-80 percent charge in about 40 minutes using 100kW DC fast charging or just over 10 hours using home charging with a 230V/32AMP AC wall box (7kW). I won’t get into the overall looks of the I-Pace here save to say it meets or even exceeds Jaguars models’ typical, distinctive good looks inside and out. Jaguar also has been doing a lot of catching up with competitors in the area of operation of technological features, though the short time in the I-Pace didn’t allow for much opportunity to check that out. 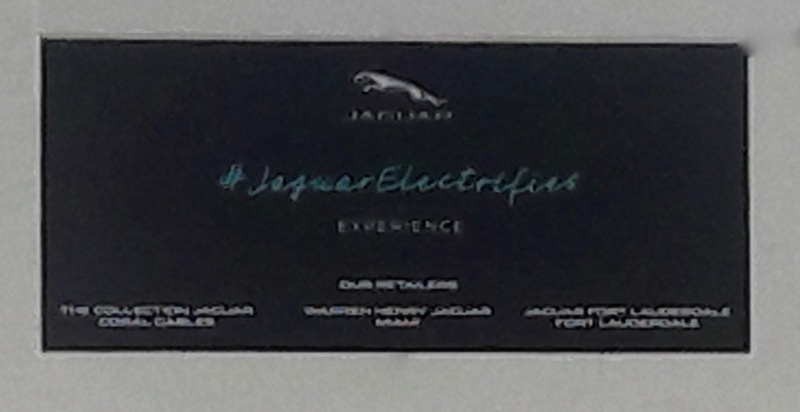 Assuming you live in either in South Florida or will be in the LA or New York metro areas when the Jaguar Electrifies Experience arrives there, you will have the opportunity to see for yourself. Just keep an eye out for the advertising and social media sources promoting the event for details! 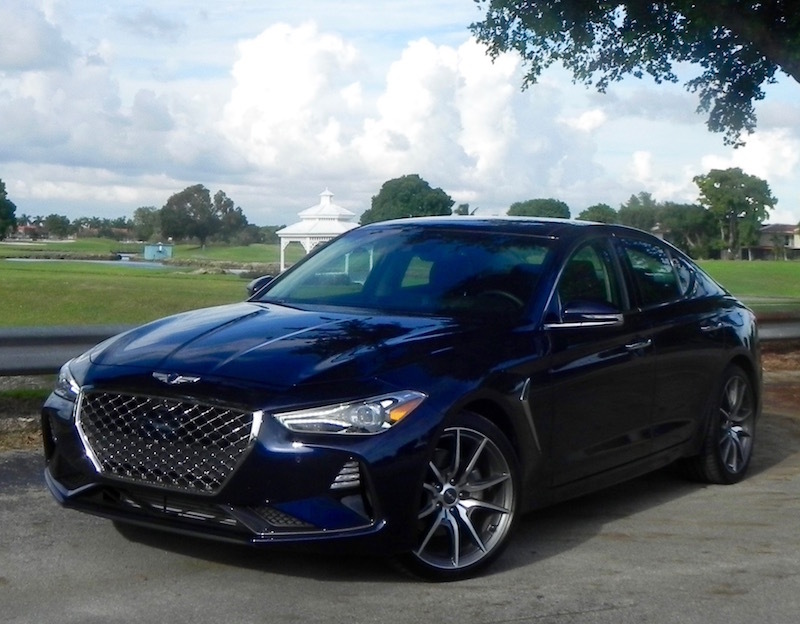 Disposed of the Hyundai label and launched as a separate brand from the South Korean manufacturer three years ago, Genesis continues to expand its portfolio with the introduction of its G70 luxury sedan for 2019. As you might deduce from the alpha-numeric naming system, it is the smallest of the three sedans now under the Genesis banner following the G90 and G80 sedans that have been around for a couple of years. Genesis also says it is the third and last sedan of the six new models the company plans to have out by 2020. It should be noted, however, that “smallest” does not necessarily mean “subcompact” or “too small” for comfort. In fact, at 184.4 inches long and with a wheelbase of 111.6 inches, the G70 virtually matches in size the Mercedes-Benz C-Class (184.5/111.8) and BMW’s 3-Series sedans (182.5/110.6). The G70 comes in five trim levels (Advanced, Elite, Prestige, Dynamic, and Sport) with either a 3.3-liter, turbocharged V6 or a 2.0-liter turbo-4 mated to a standard 8-speed automatic transmission. Rear-wheel drive is standard with all-wheel also available on some trims. 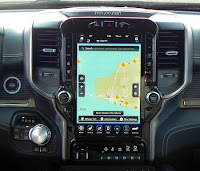 Prefer a manual instead of paddle shifters? The 2.0T-6M/T Sport (RWD only) comes with a 6-speed manual transmission. Pricing starts at $34,900 for 2.0T RWD models and $36,900 for 2.0T AWD with the various packages adding to the base cost as the trim levels go up. 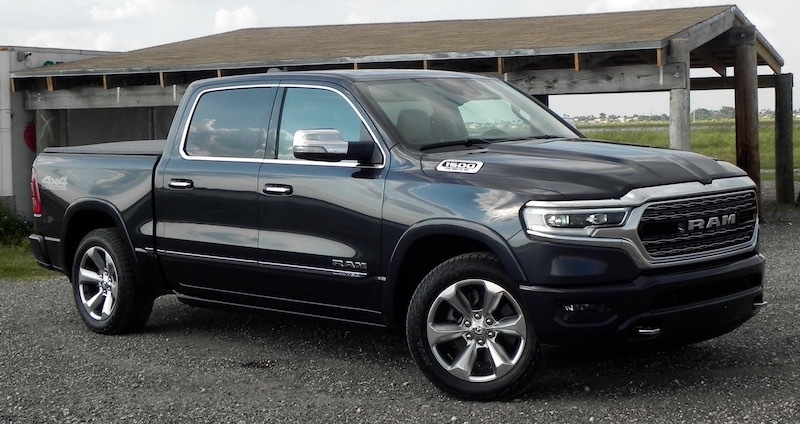 The Elite package adds $5,000 to the base MSRP, and the Prestige, which includes the Elite features, adds another $3,000 to the cost of the Elite and on up the line. The 3.3T models run from $43,750 for RWD models to $52,250 for the AWD, Dynamic Edition. Oh. Add another $995 for destination and delivery. My time was spent in the RWD 2.0T with the Elite, Prestige, and Dynamic packages running the final total to $44,895. 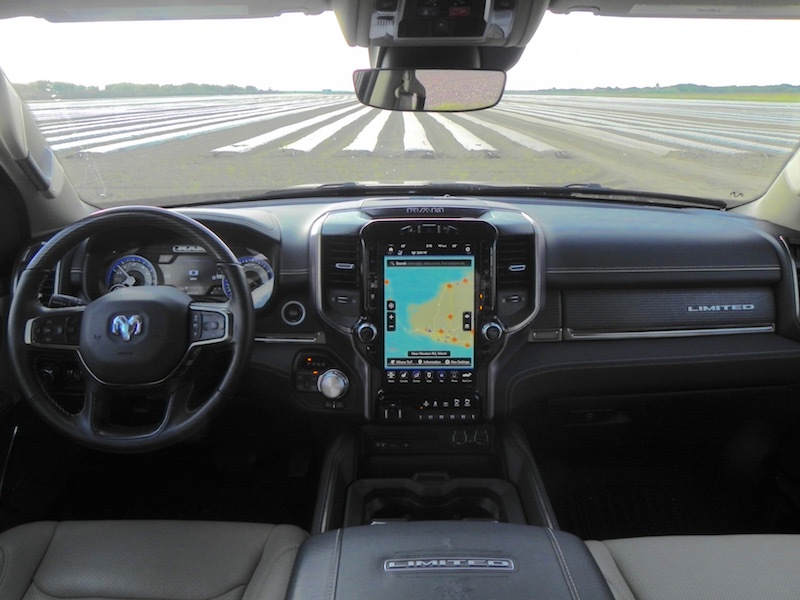 With those packages, in addition to standard features like 18-inch alloy wheels, push-button start, LED daytime running lights, dual climate control, lane-keeping assist and a Bluetooth hands-free phone system, you get such niceties as a power tilt-and-telescoping steering wheel (replacing the standard manual), 19-inch wheels (replacing the 18s), a navigation system, full LED headlights, parking warnings, heated and ventilated front seats, a sunroof, premium Lexicon 15-speaker sound system, leather seating surfaces (replacing leatherette), head-up display, surround view camera system, microfiber suede headliner and heated rear seats. 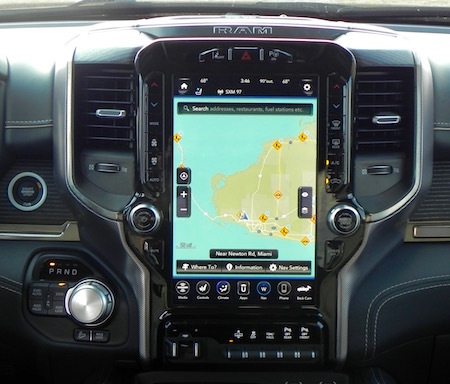 Actually, the list of both standard and optional features is a bit longer, but you get the idea. 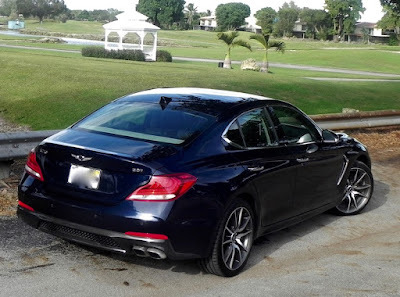 As I wrote in March about the G90 and again last May about the G80, Genesis is a true luxury vehicle with all the trimmings you expect of the segment. 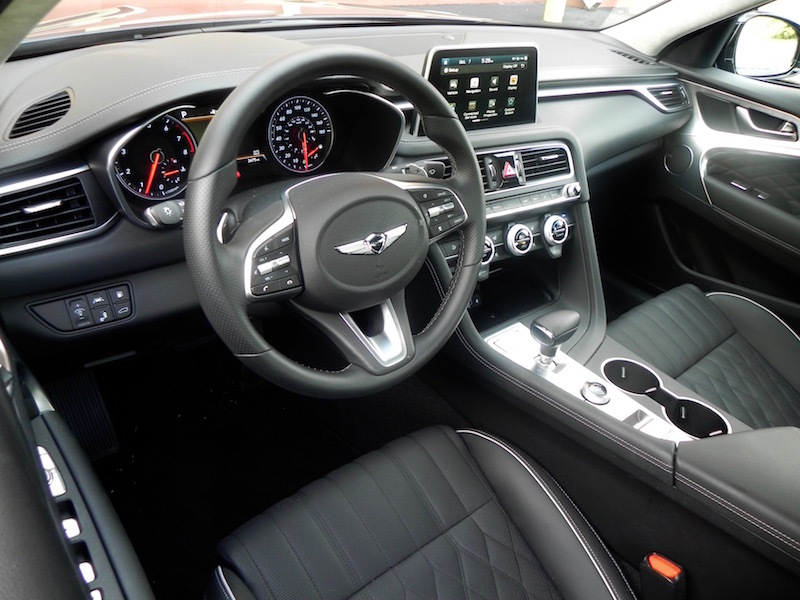 The ride is smooth and quiet, and you may set the G70 in one of five driving modes by twisting a knob on the console to select Sport, Comfort, Smart, Eco or Custom to match your mood. When it comes to comfort and convenience, the G70 ranks among the best of them for the passenger, too. Well, at least the rider in the front seat. Adults, especially taller ones, may find the back a bit confining when it comes to legroom. Genesis may not have the brand cachet of some of the traditional luxury marques, but it has everything else. You’ll be doing yourself a disfavor if you don’t check it out if you’re shopping in the segment. What I liked about the 2019 Genesis G70: Infotainment functions are very user friendly — thanks in a large part to the use of traditional knob and button controls — and there is plenty of them. The 8-inch display screen is much-appreciated. As I have noted in many reviews of Genesis and parent-company Hyundai’s products, the South Koreans have a knack for taking technology and simplifying it so even techno newbies can understand and operate it. It’s like Mac vs. PC. Finally, the fun-to-drive quotient is high. What I didn't like about the 2019 Genesis G70: Trunk capacity is stingy (10.5 cubic feet), which makes it impractical as a family vehicle (but fine for empty-nesters). 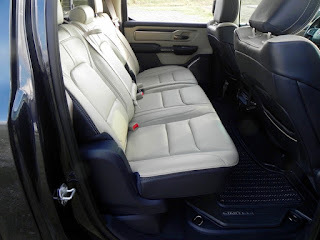 As with its competitors in the luxury small sedan segment, the backseat is on the tight side. Fuel mileage is ordinary in the 2.0T (22 miles-per-gallon city, 30 highway, 25 combined). Would I buy the 2019 Genesis G70? In a heartbeat. 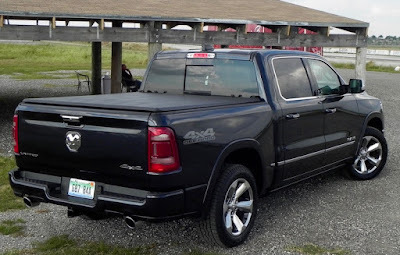 Your only qualm should be the overall size (including trunk capacity). If you need more room for you and your stuff, prepare to step up to the G80.